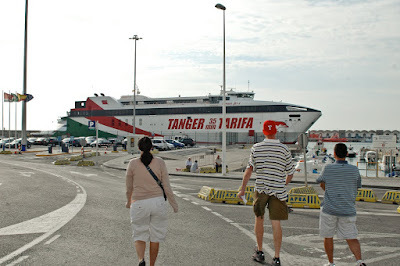 On our second day, we got up bright & early & headed south to Tarifa, Spain where we would catch a ferry to Tanger, Morocco. After several wrong turns on our first day, we wanted to build in enough time to get lost. It was an easy drive though (just lots of tolls). 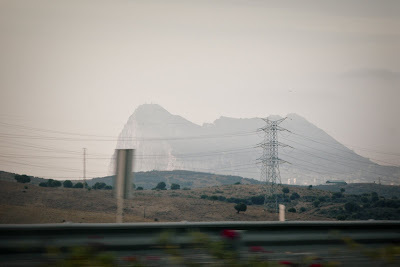 We passed the Rock of Gibraltar along the way. With another day, Nick would have dragged us all to see the monkeys. I'm pretty impressed with this shot over Nick's shoulder as he was driving. Here we are gazing at Africa. Pretty cool. 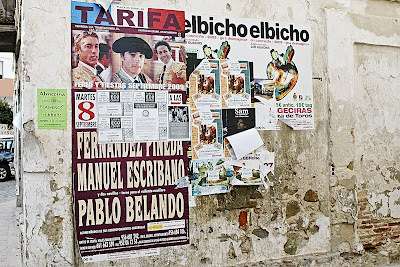 We arrived in Tarifa with hours to spare. Morocco is 2 hours behind Spain in the summer so we took an 11 am ferry & arrived in Morocco at 9:30 am. Parking was not an issue in Tarifa. Plenty of places offering all day parking within walking distance of the ferry. And, it wasn't underground with tiny little stalls much to Nick's delight. Maybe it's busier in the summer, but we had absolutely no problem finding a place to leave the car. As we were walking, we saw lots of after-bars still open. You know, the place that opens from 3am-7am. Surprisingly, a lot of the patrons were significantly older than us. It was a Sunday & nothing was really open in town. Cecilia was bracing for a day of unfamiliar food, so we decided to do what we do best - eat again. 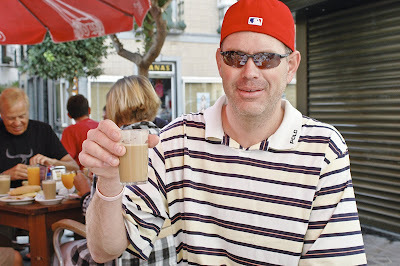 We ordered cafe con leche (yum). Can you see the nice German family behind Nick eating ham sandwiches for breakfast? No one laughed at them. Cecilia doesn't drink coffee, so she ordered hot chocolate. We also ordered churro's to share. 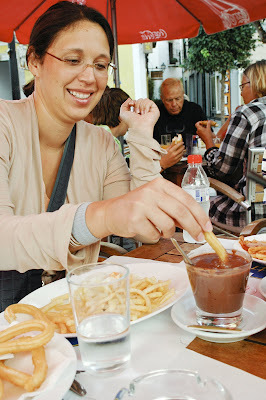 The hot chocolate is very thick - more like melted chocolate than the watery drink we are used to. They are dipped in the hot chocolate or eaten with sprinkled sugar. Churros don't really have much flavor to them. As you can see from Cecilia's plate, instead of traditional breakfast potatoes, they served french fries with their eggs. That was our first clue that we didn't order the local fare. Our second clue was the table of Spaniards laughing & pointing at us. Seriously. After breakfast, it was time to board the ferry. Our Moroccan travel guide bought our tickets so we just provided a confirmation number. I was very surprised to see the size of our ferry, but it explains the expense - 66 euros (about $75) for a 30 minute ride. You go through customs on the ferry so it's an easy exit once you arrive at port. I'll blog about Morocco tomorrow. We left Morocco later than expected & were all anxious to get home. 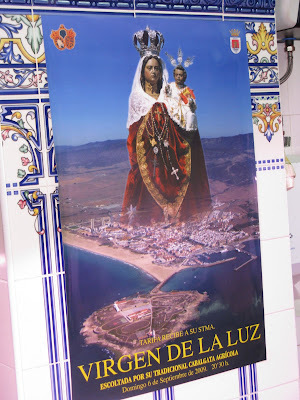 But, upon arrival in Tarifa, we stumbled upon the Fiesta de la Virgen de Luz. It seemed like the whole town was out celebrating. 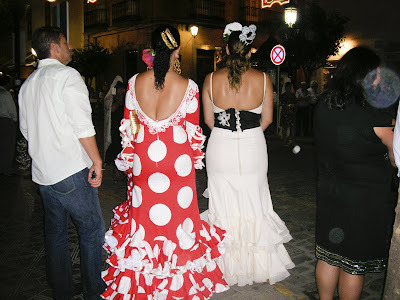 It was fun to see fancy flamenco dresses & mantilla's being worn & not just hanging in souvenir shop windows. I know, these girls look like ghosts. Ugh. I should have just used my camera that I know how to work. 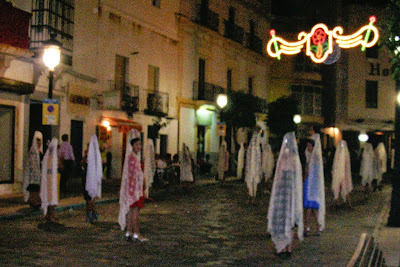 But, you get the idea - it was a very special religious celebration. 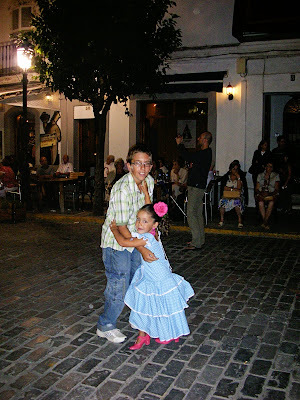 While Ella was very excited about her flamenco dress, even before she saw this picture, she commented that she wished she had the fancy shoes too. I tried using my Mom's camera for a lot of these shots. Bad idea. Travel Tip: Don't try using cameras that you haven't used before. 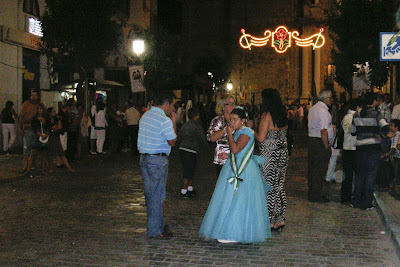 Cute young girls in their fancy dresses. 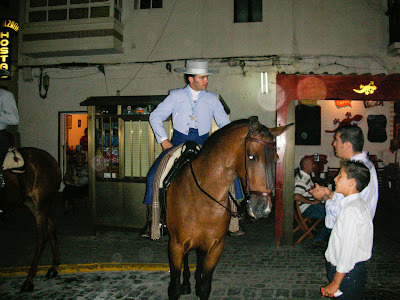 The handsome horse rider. We grabbed a quick sandwich & drinks & drove back to Malaga. Given the jet lag, we were all wired & stayed up way too late on our second night which meant a late start on Day #3. 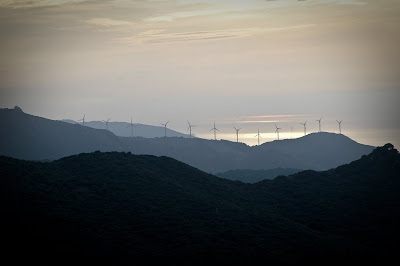 Given the strong winds through the straits, there are a lot of wind turbines. 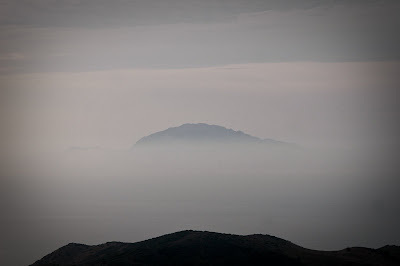 I realized after we left the town, that we didn't see any wind or kite surfers (who are attracted to the strong winds). 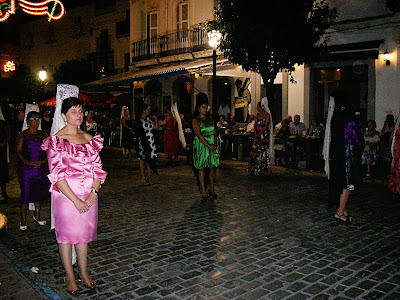 If we had another day, I would have looked for surfers & visited Cadiz.